That was the mood when I attended Pez Cantina’s pop-up a few weeks ago: Suspicious! Pez Cantina, from restaurateurs Bret Thompson and Israel Ramirez, will be opening soon on the ground floor of Bunker Hill’s Mellon Bank Center in DTLA; it’s partly inspired by the Pez Cantina team fishing trips to Loreto in the state of Baja California Sur, which would include chef de cuisine Aaron Esquibel. I’ve been a regular visitor to Loreto for it’s great scuba diving, beautiful protected waters and excellent seafood, especially the fish tacos made with local catch like yellowtail, dorado, and wahoo. <>Pez Cantina’s “Loreto” fish taco was a pleasant surprise–it’s simple–a tasty, plump, tempura-battered fish filet is laid on a fresh pressed tortilla made by the best dressed tortilla ladies ever (family members that filled in at the last minute), and a fast pickled salad of purple cabbage, lettuce, and herbs that brightens up the crispy cocoon housing the tender fish. A dab of salsa adds some heat and saltiness. 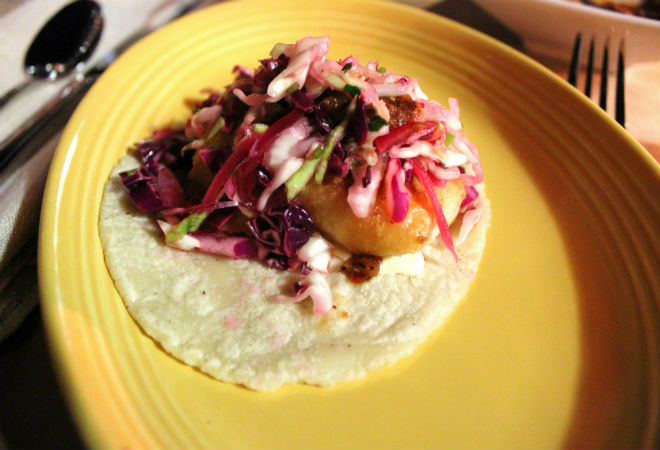 It’s everything you want in a fish taco: the fish and batter are seasoned as to highlight the product, there’s some citrus and crunch from the salad, and the lightly flavored white corn tortillas balance the taco. This is a sign of good things to come.